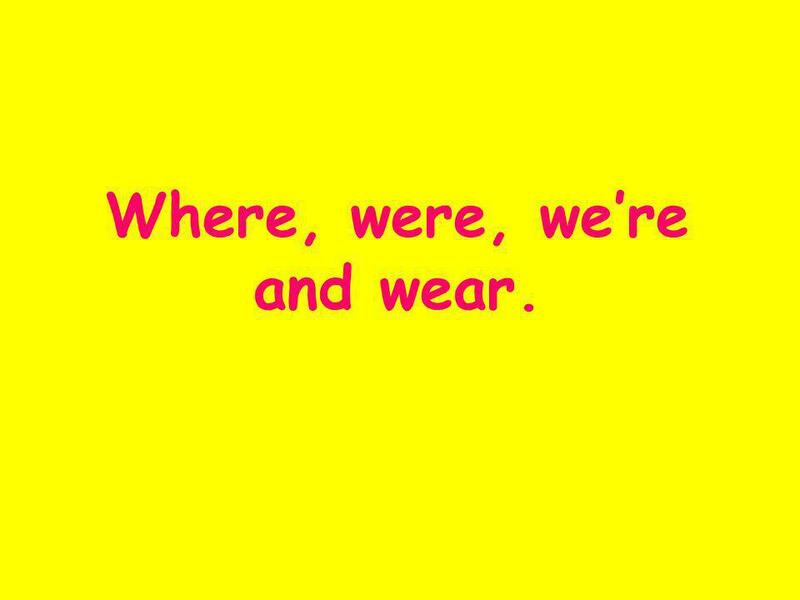 Where, were, were and wear.. Where Where refers to a place. It can be a question word! Examples : Where are you going? That's where I put it. More examples? 1 Where, were, were and wear. 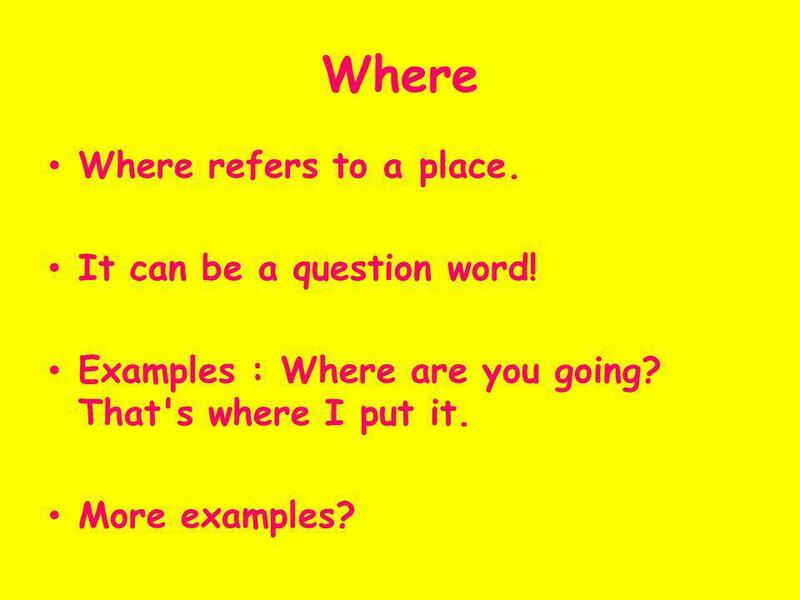 2 Where Where refers to a place. It can be a question word! Examples : Where are you going? That's where I put it. More examples? 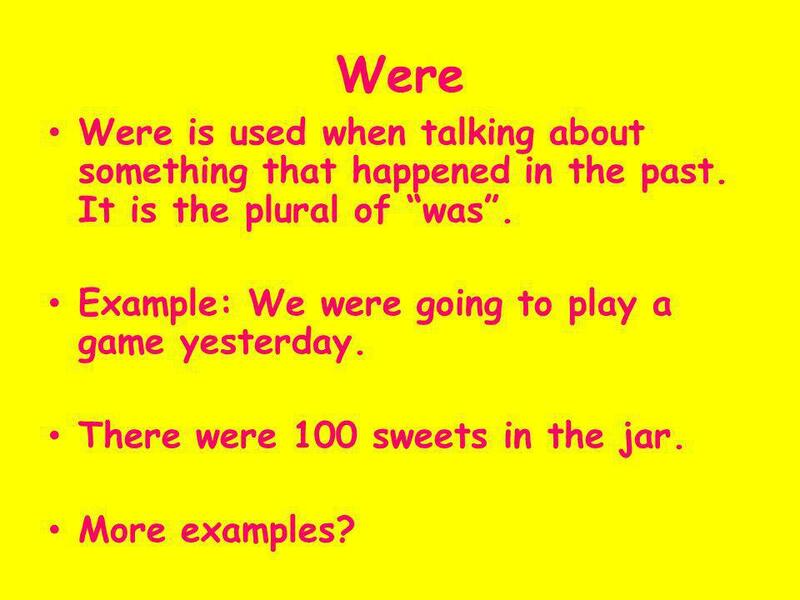 3 Were Were is used when talking about something that happened in the past. It is the plural of was. Example: We were going to play a game yesterday. There were 100 sweets in the jar. More examples? 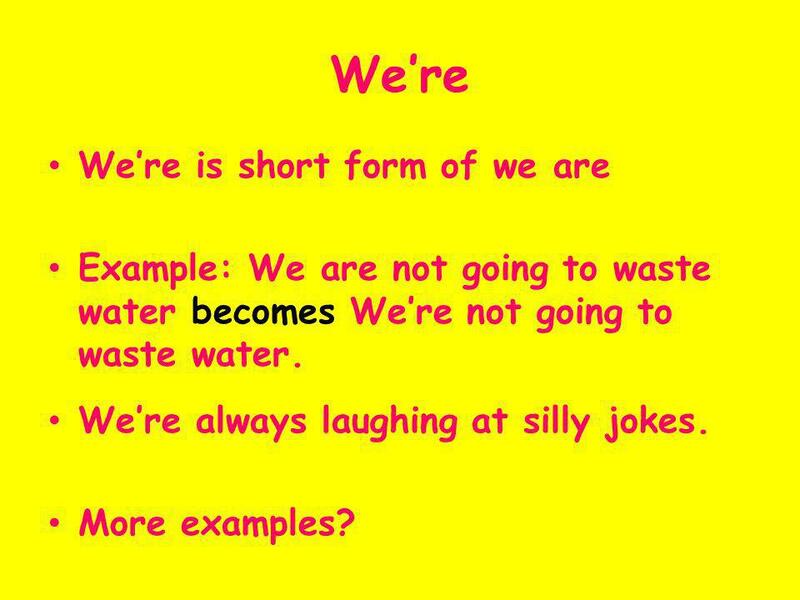 4 Were Were is short form of we are Example: We are not going to waste water becomes Were not going to waste water. Were always laughing at silly jokes. More examples? 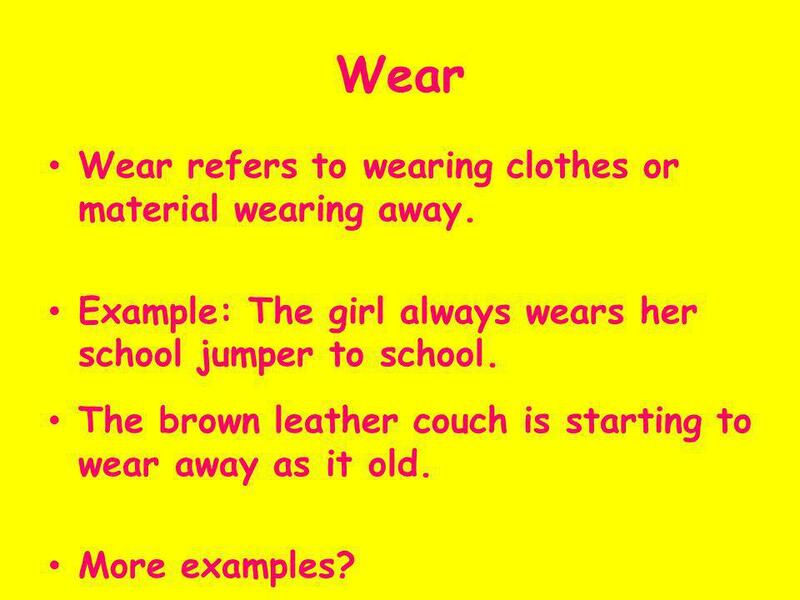 5 Wear Wear refers to wearing clothes or material wearing away. Example: The girl always wears her school jumper to school. The brown leather couch is starting to wear away as it old. More examples? Download ppt "Where, were, were and wear.. Where Where refers to a place. It can be a question word! Examples : Where are you going? That's where I put it. More examples?" Questions: 1. What is the meaning of your look? 2. Is your look the mirror of your personality? 3. Do you think that fashion is very important in every. Do you know when to use each correctly? Let us examine some of the words and phrases used in Weather Words slides. Streets Of London Have you seen the old man In the closed down market, Kicking up the papers with his worn out shoes? In his eyes you see no pride, Hands. One day on the top field of Greerton Village School, much concentration was happening, it was the most important game of the season. © 2011 wheresjenny.com Conversations. © 2011 wheresjenny.com Conversations Conversation 1 Kate: Hey Tina. Tina: Hello Kate. Kate: I heard that you and. Subjects and Predicate Escapade The Old School Teacher Click your mouse or use the right arrow key to move to the next slide. Eighth Grade Safe Environment Resources and Assessment Materials. All About Soccer By Melisa Escamilla. I am going to talk about soccer. “GET” SOME PRACTICE Expressions with get. Loser’s Defenses To identify defensive behaviors individuals use to keep themselves from losing. Time Capsule. It can tell us the time we live in. Subject-Verb tense Agreement. Question What does it mean to make your subject and verb tense agree?